I'm thinking this Sea Dragon is going to be brand new, not used. I think they were referencing a ride like this being on the carnival circuit. And before I forget, Chance still makes the Sea Dragon theme available. Galveston Pleasure Pier just built a brand new one last year. Great news for the park. 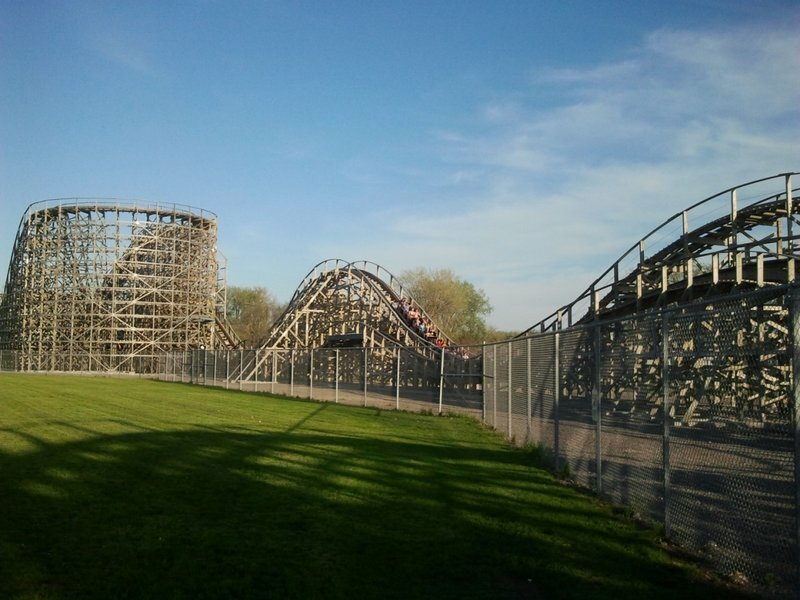 Zippin Pippin is turning out to be a hell of an investment! ^All that for $1 a ride! 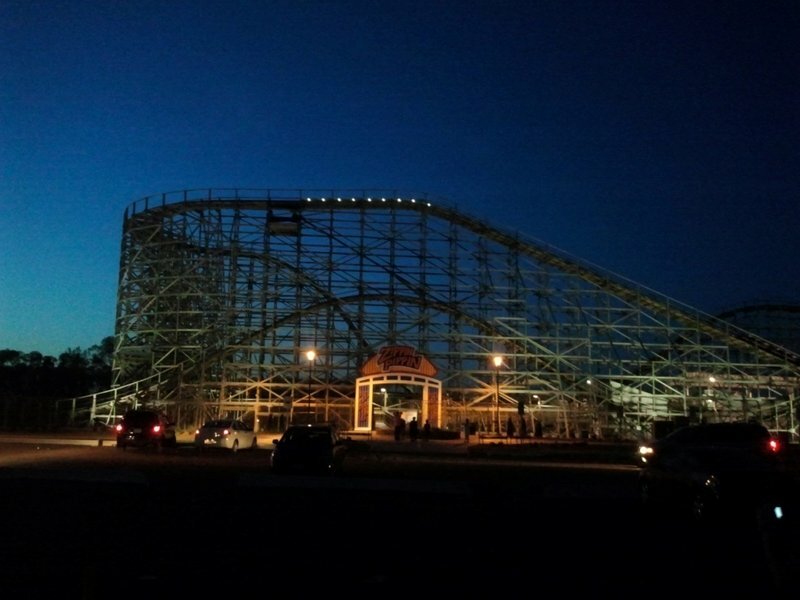 Improvements to Bay Beach Amusement Park is in the works, according to Green Bay park officials. 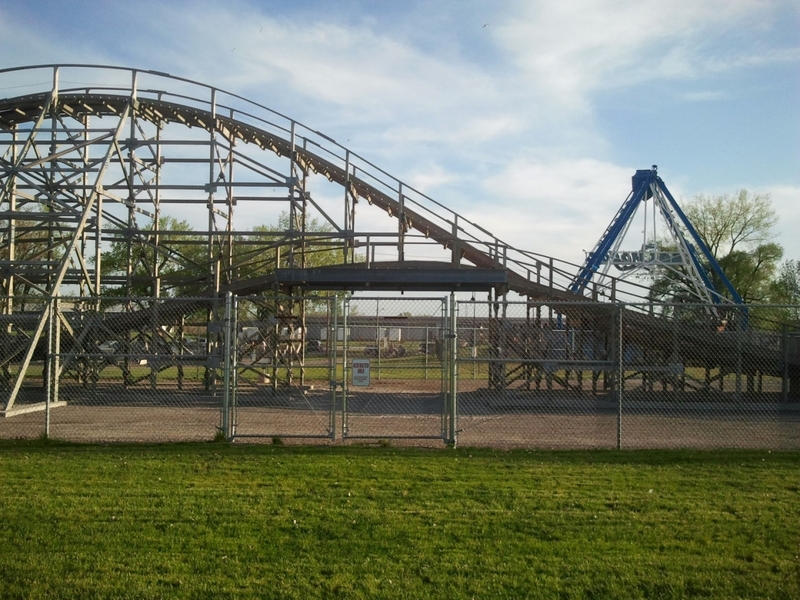 A new concession stand is planned, as is new lighting, a 400 stall parking lot and cosmetic upgrades to the Zippin Pippin roller coaster and the Sea Dragon. The price tag for all of that is expected to be north of $800,000. Park revenue is expected to cover those costs, and the city is also near a $500,000 grant. With the arrival of the Zippin Pippin three years ago, and the Sea Dragon late last summer, the west end of Bay Beach has been a popular place to be. That area remains the focus of city parks officials. Should things go according to plan this summer, officials say more fun projects will begin. That entails moving the route of the train to include a track heading west and a path underneath the Zippin Pippin. “I think people are really going to love it. 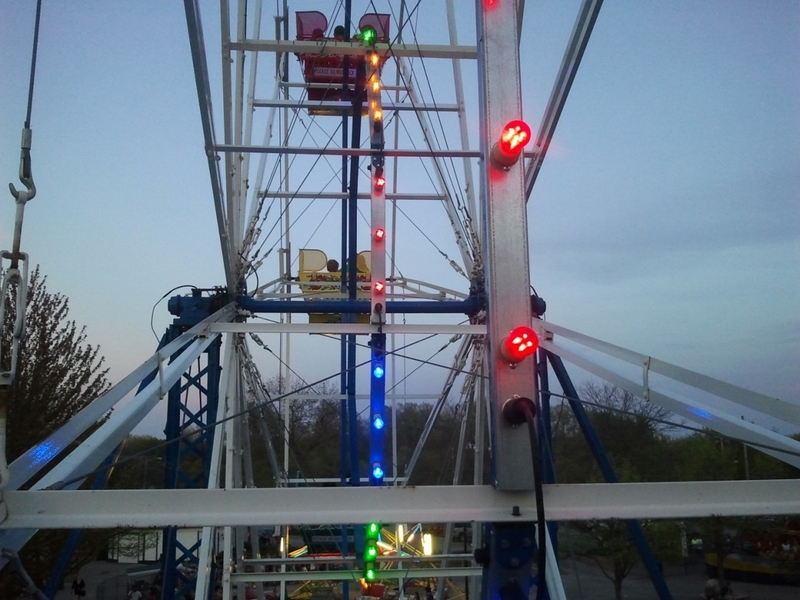 It gives you a better view of the Bay, it gives you the excitement of going under the Zippin Pippin when it’s moving, so it’ll add a new dimension to that ride,” Dawne Cramer, the director of Green Bay’s parks department, told FOX 11. 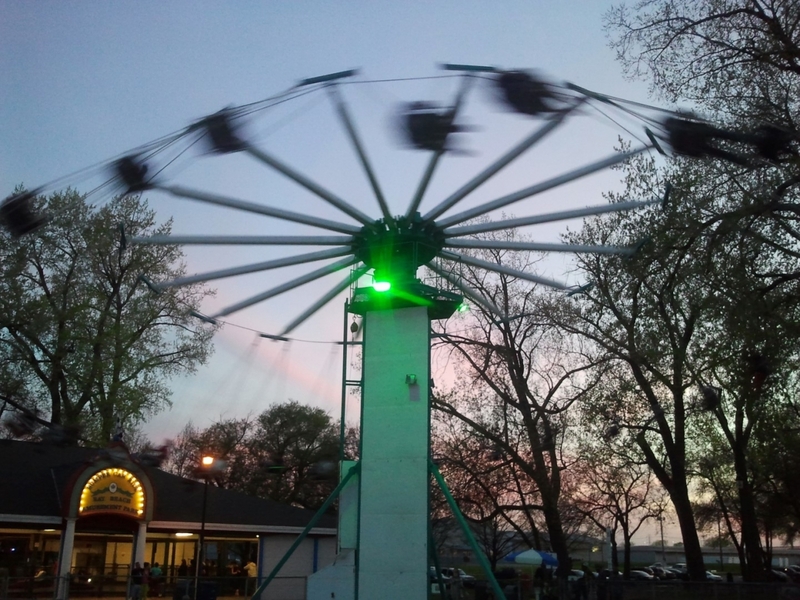 The city of Green Bay is also looking for the amusement park's 20th ride. “We haven’t zeroed in on a specific ride yet and when we do that then we’ll kind of look around to the various areas a lot more and be able to kind of focus our attention on one ride,” Jason Arnold, assistant facilities manager for the city, told FOX 11. Adding a ride fits the park’s master plan, which was updated last year. 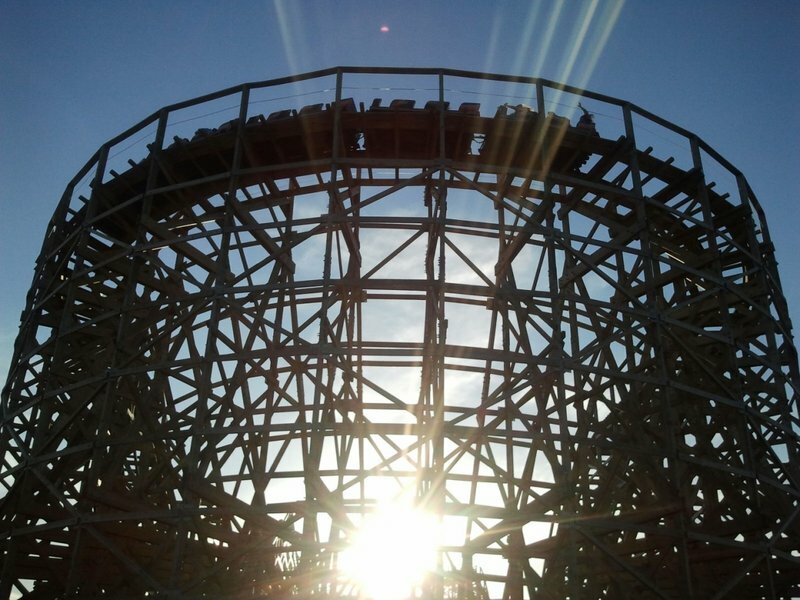 It calls for at least one ride to be added every two years for the next seven years. The opening of Bay Beach won't happen this year for almost three months. Anyone still up there know how Zippin Pippin's riding this year? ^Better than opening day 2011! My buddy Brian and I went up to Bay Beach for Memorial Day weekend (May 24/25). I haven't been there since 2011, and I'm happy to report Zippin Pippin is running better than then! I rode the original Zippin Pippin back in 1990. The track design/layout is 90% the same, but the ride experience is totally different. The long 5 car/3 bench PTC train flys through the layout at a Phoenix pace. The original ride used a 4 car train, so less momentum. But the train used at Libertyland also had buzz bars and no seat divider, so that's a trade off. It also had a skid brake along the turn around, and this one doesn't. No brakes, and a re-designed bunny hop near the end that will almost hurt you make for a great ride. I couldn't believe how clean and well maintained the park was. The Eli Ferris Wheel, Tilt-a-whirl, mini railroad and everything else looked like brand new! 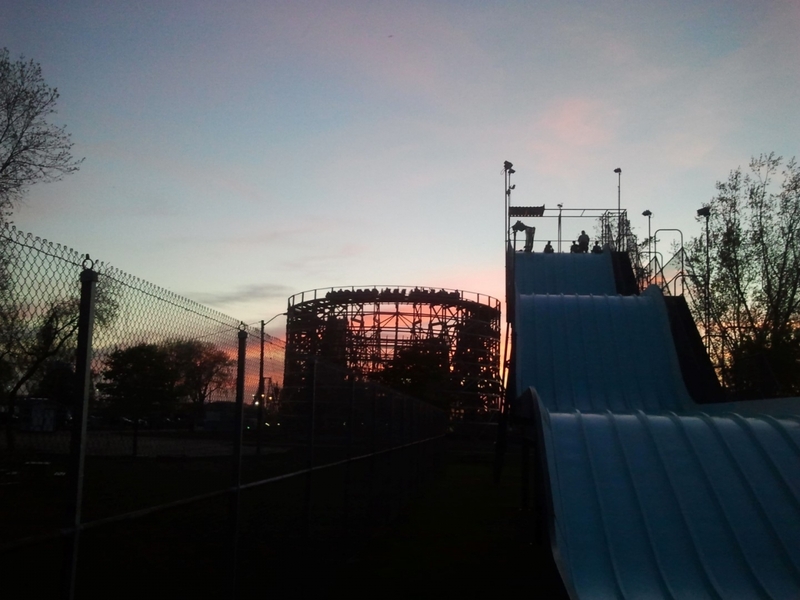 A great relaxing day and a half at a traditional city park/amusement park. Free parking, great service, clean and well maintained rides. Can't wait to get back! So simple and effective at just 70 feet. Up and down; no fancy parabolic stuff or "heartlines" and it works perfectly. The single most violent air time I've ever experienced. Yes, more violent than Screechin' Eagle, Cyclops, Texas Cyclone or El Toro. You can see the top of the hill going right to left; it gets you as you go up to the hill. It's like a ramp, then BAM, you are at the top of the bunny hop. 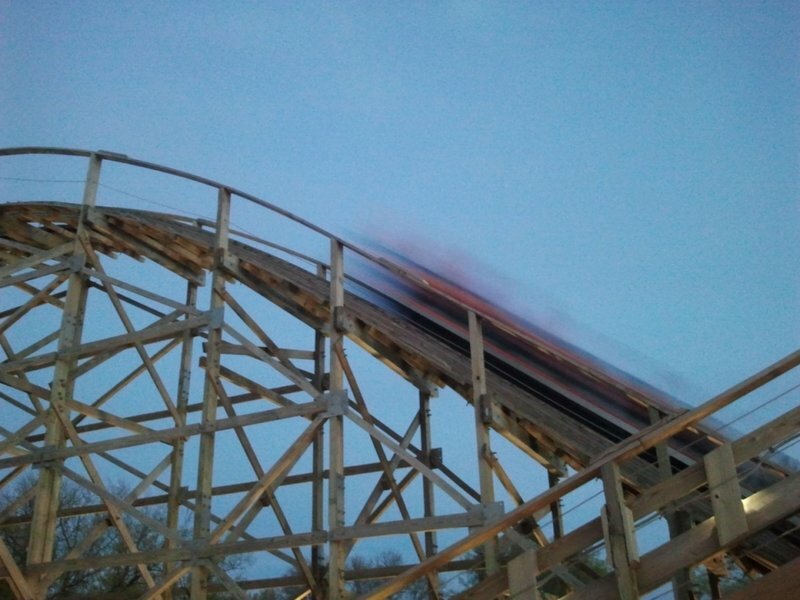 When Gravity Group built the ride, they said something to the effect of adding "a little surprise near the end." Every single light bulb is functional in the park. I have never seen a park so well taken care of. Every ride is in pristine condition. Lots of rides (like the Tilt-a-whirl) have their own set of vehicle tarps which are put on the ride every night. 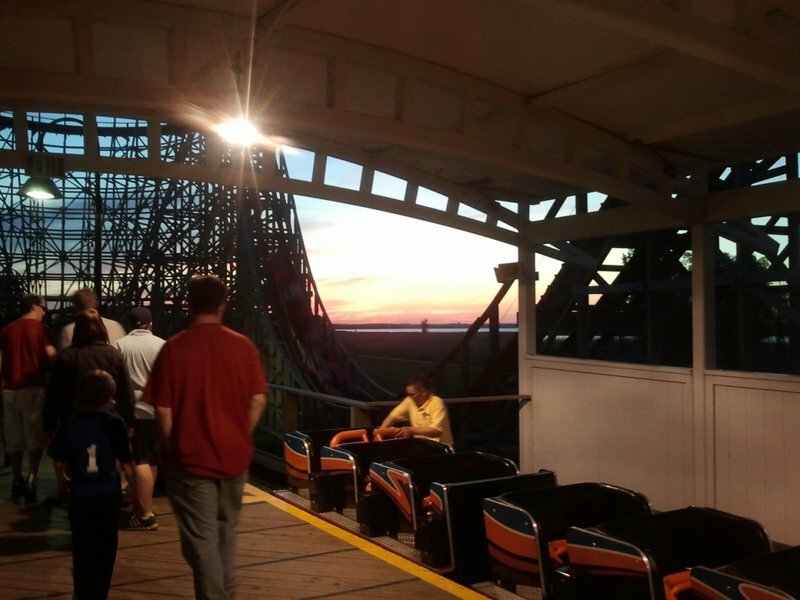 When I worked on the Cedar Point Blue Streak, it was part of our routine to cover the trains every night; "put them to sleep" we used to say. The only complaint about Zippin Pippin is the station set up. 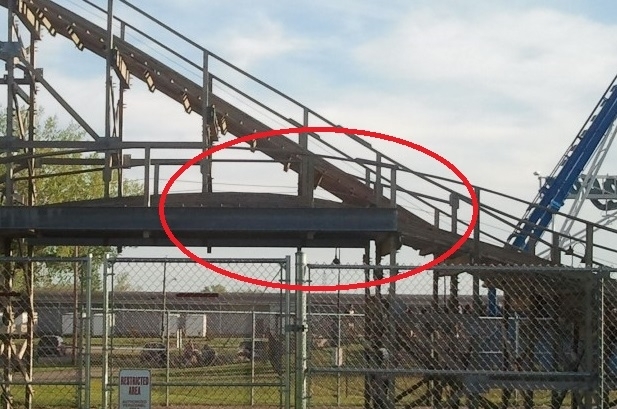 They wanted the ride to be as close to the original, so they put the transfer track right next to the boarding track. Guests have to walk in front of the those waiting behind queue gates and exit before queue gates open. We all know what that means. But even with this flaw, the lines are not very long. But because of this awkward set up, every single train "stacks" outside the station. Sea Dragon ready to sleep! One more for the road. THEE bunny hop of (fill in the blank). I loved that bunny hill. It was one of those WTF Moments on a coaster. Bay Beach needs to teach Mt. Olympus a thing or 2 about operations. ^^ Thanks for the report! I grew up in Door County and as a small kid we would go to Bay Beach with my Grandma who would babysit me while I rode the kiddy rides. Some of my fondest memories in life are of riding the train there which I link back my desire to be an engineer, my fascination in trains, and my love of theme parks and rides. I'm very happy to see them taking such good care of everything. I'll actually be driving back up to Door County on Friday so I'll be able to snag a few rides on it. I remember the first time I rode it, that pop on that camelback took me but a humongous surprise. I'm looking forward to that ejector air again. I have always preferred Carmex over Blistex and ChapStick, and now I like them even more. GREEN BAY (WITI) — Most people don’t have trains in their backyard, but one Wisconsin man did! Now, his son is giving those trains away, and he believes he’s found a good use for them. 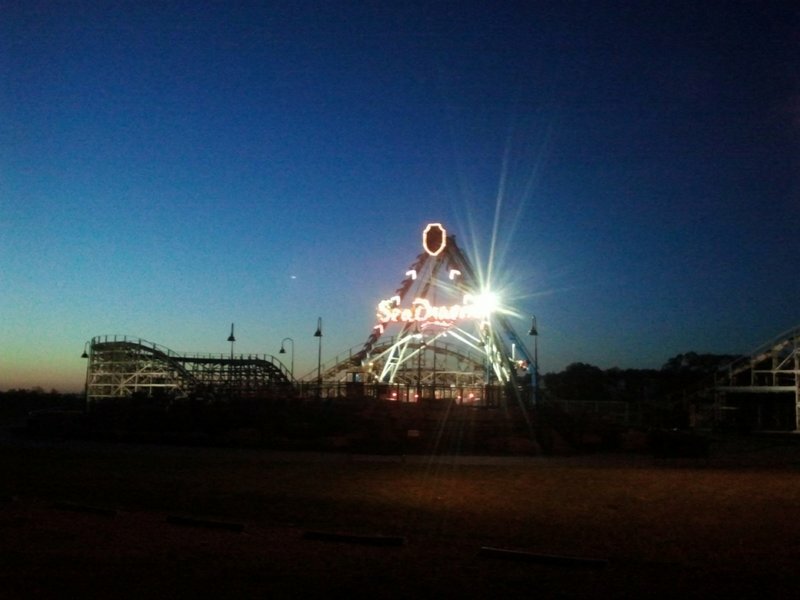 For years, Bay Beach Amusement Park has been a favorite spot for Pat Schroeder’s family. “We’re married 50 years, so I would so that we’ve been coming about 50 years, off and on,” Schroeder said. The city-owned park could be getting a donation from the family that owns the lip-balm company Carmex. Paul Woelbing is the president of Carma Laboratories in the Milwaukee suburb of Franklin. “My dad’s big pleasure in life was giving kids rides,” Woelbing said. He says his late father had 3,000 feet of train tracks in his backyard. “He was just anxious for neighbors to come over or any work associates to come over and give their kids rides,” Woelbing said. Woelbing believes Bay Beach would a great place to honor his dad. He’s been to the park before, and wants to donate three trains. “I just love the idea that it was run by the city and the fact that families can come, and with $20 in their pocket, have a great day,” Woelbing said. Bay Beach has two trains on a small track right now. City leaders have already discussed expanding it. Part of the park’s master plan calls for the train to run under the Zippin’ Pippin Roller Coaster. “Anything that’s added to the park will make everything so much better,” Schroeder said. Schroeder is excited about the possible new trains. Woelbing hopes the donation can happen this year. “It was wonderful when it was small, so it will be even better when it’s bigger,” Schroeder said. Green Bay’s Parks Committee will discuss the donation request at its meeting next Wednesday, July 9th and will explain the plans for the trains after that meeting.